CES: Mattress manufacturer Leggett & Platt has created either the ultimate bed of the future or an expensive piece of iCrap. The headboard projector boasts a 1080p LCD based projector with a 6000:1 contrast ratio and 2,000 lumens. It casts a 120-inch (10-foot) screen on the wall and can be used to project movies, books, music navigation features, the Internet, the Good Morning screen and the local daily weather. The Starry Night provides wireless Internet connectivity and a wireless keyboard. The Internet is projected via the 120-inch screen. The bed and electronics can be controlled via the Good Morning touch screen or a wireless RF remote via Microsoft’s Media Center. You can recharge your iPod on the built-in docking station. The Starry Night boasts 1.5 terabytes (1,500 gigabytes) of disc storage for almost 400,000 songs or up to 2,000 hours of video. Its operating system runs on a solid state hard drive for fast data transfer and low seek times. It also offers 4 gigs of ddr2 ram. The Starry Night Bed uses vibration sensors and load cell technologies to measure how much a sleeper tosses and turns, and how often they get out of bed during the night. The same vibration sensor technology detects and monitors rhythmic breathing patterns that indicate relaxation. It compares these movements to a 30-day baseline measure of the sleeper and then provides tips to improve sleep quality. The be detects snoring with a refined vibration-detection system (originally developed for military purposes) and automatically articulates sleep position by seven degrees to open the nasal passages and help alleviate mild to moderate snoring. Once the snoring subsides, the bed returns to its original position. In the morning, the bed provides a Good Morning Screen that shows fever charts that indicate the chronology of movements and snoring during the night, and the history screen compares last night‚Äôs sleep to previously recorded sleep patterns. After a night of bad sleep, the Tips Section offers suggestions for improving a person‚Äôs energy during the day and getting a better night‚Äôs rest the following evening. 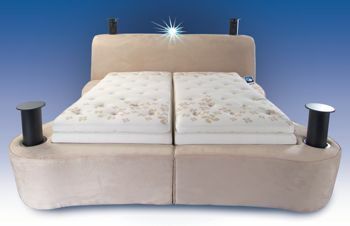 Using liquid-based Peltier technology, the mattress can be set to ‚Äúpre-heat‚Äù or ‚Äúpre-cool‚Äù both sides of the bed from 68 degrees to 117 degrees Fahrenheit. Where would I find this bed? In searching it does not tell me outlets.